Patients receive a more individualized service that is expertly coordinated by the PSH team across multiple departments and phases of care. This care plan is tailored to use the patient’s time efficiently while reducing redundancies, length of stay in the hospital and avoidable readmissions to the hospital for complications post-surgery. Patient education, shared-decision making, clinical pathways, and evidence-based practices that reduce variability, lower costs and enhance the patient experience are the foundation of the Perioperative Surgical Home. The patient is well informed and knows what to expect throughout the pre-operation, surgery, post-operation and recovery period. The Perioperative Surgical Home care team fortifies a well-established line of communication between the surgeon, anesthesiologist, hospitalist, patient and surgical care providers every step of the way. The result is a seamless, integrative approach to surgery. This ensures the patient is medically optimized prior to surgery, experiences an uneventful, smooth hospital course, and transitions home for a quick return to normal activity. The anesthesiologists are uniquely qualified to standardize this new evidence-based model of care that fortifies the lines of communication between the patient, surgeon, anesthesiologist, nurses and care teams across the perioperative, intraoperative, postoperative and home recovery phases. These multidisciplinary teams meets once a week to ensure continuity of care. The Perioperative Surgical Home team is on board from the moment the decision for surgery is made. The surgeon, anesthesiologist and other surgical care providers involved in the care processes equip the patient with all information necessary to make an individualized, surgical plan that maps out the best course of treatment. The plan includes the surgery date, referral to the surgical preparation class, appointment with the perioperative clinic, an outlined discharge plan and expected discharge date. This clarity of what to expect provides the patient with a summary of the entire process; from home to surgery then back again to return to normal activity. By providing the patient with this information early, there are few unknowns that could result in preventable cancellation and complications of the surgery. The patient is in the guided hands of the Perioperative Surgical Team from this moment until 30 days post-discharge from the hospital. Following the decision for surgery, the patient officially enters the pre-operative phase that will determine the blueprint for the entire surgical episode. The Preoperative Admission Team is responsible a seamless transition to intraoperative and postoperative care for the patient and is driven by patient-centered philosophy of care. The anesthesiologist interviews the patient to collect a preoperative health and risk assessment that includes medical history, past surgeries, any complications related to anesthesia, medications, diseases and allergies to medications/anesthesia. The Pre-Operation Summary is generated from this interview and provides the pre-op team with the plan for preoperative testing. At the preoperative clinic, the patient undergoes testing based on his or her specific health condition as opposed to being based on the procedure. At this time, the health/medical condition of the patient determines hemoglobin, statin, beta blocker, VTE and nutrition management. The completed pre-op summary provides the team with the data needed to determine the most effective and strategic implant, anesthesia combination, and prevention pathways to employ. Patients will receive specific instructions for prophylactic prescriptions, a tailored regimen for current medications and enhanced nutrition prior to the surgery. Preoperative therapy prescriptions will also be provided. Patients will attend a surgical preparation class to understand what anesthesia will be used and why, how vitals will be observed during surgery and the best plan for discharge. For example, in a hip replacement surgery, patients will learn how many days they will be in hospital after the surgery, when they will expect to return to normal nutrition, when they will walk with a walker and be discharged from the hospital. They will also learn the timeline or the expectation to return to normal activity that is goal-oriented i.e. walking with a walker in week one, then the cane in the second week and walking without aid by week six. Patients will determine during the class if they want to be discharged home or to a rehabilitation facility. This plan is very individualized, yet framed by evidence-based protocols for best surgical practices and patient care. This early pre-operative planning by the anesthesiologist combined with the patient education sets the precedence for a clear picture of where complications may arise and where they can be prevented. This ultimately reduces costs of care while simultaneously improving the quality of care. Research has shown patients empowered with surgical preparation education enter surgery with less fear and anxiety, which sets the stage for optimal healing after surgery and faster return to normal activity. This course reduces complications, shortens length of stay in hospital, reduces readmission for emergencies post-surgery and ultimately leads to greater patient satisfaction. The Intraoperative Team coordinates the day of surgery events for the patient as they arrive at the hospital, book into the pre-operation unit, enter the operating room and transfer in acute postoperative care. The goal of the Intraoperative Team is to ensure standardized protocols for individualized, tailored anesthesia care as well as standardized equipment in the operating room and nursing protocols. Infection preventions therapies must be in place and goal-directed fluid therapy to optimize fluid management is critical to ensure quick recovery for the patient after surgery. The Intraoperative Team is split into two to ensure the highest level of safety, quality and efficiency of care is adhered to in the operating room when time is critical for the patient under anesthesia, the surgeon performing the operation, and the nurses. Typically, after a patient is discharged from the hospital, there is fragmented and varied communication with the hospital. Patients in the Perioperative Surgical Home program are connected to a Post-Discharge Team for 30 days post-surgery. This open line of communication between the hospital and patient at home or in a rehabilitation or skilled nursing facility prevents and reduces readmissions to the hospital post-surgery for avoidable complications. The Post-Discharge team has a standardized plan for minimizing complications in the recovery period post-surgery at home. For example, there is a 24-hour line the patient can call in case of an emergency. The telemedicine initiative is set up before the patient leaves the hospital and has a scheduled SKYPE video face-to-face call appointments in the first week home and every two weeks after as the patient is healing. These calls between the surgeon and the patient allow the surgeon to follow-up on recovery from surgery, pain, incision care and overall progression on return to normal activity. In addition, there is an occupational therapist that goes to the home to deem the environment safe and set up with medical equipment for recovery prior to surgery. We developed the Quality Measure & Performance Improvement Team to track our quality, accountability and process measures across the entire spectrum of surgical care. The anesthesiologists are coordinating the processes of all health care services provided by all specialties within the surgical episode for an accurate measure and comparison of our clinical outcomes of the Perioperative Surgical Home model. They are constantly reviewing the data to make improvements as this innovative program is implemented. Our principal investigator is collecting data to evidence and publish the program’s outcomes with the ultimate goal of improving our patient care. Figure 1. 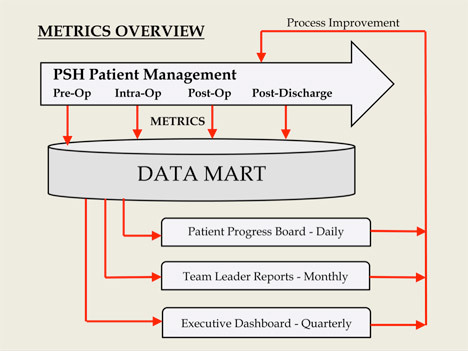 Metrics from the preoperative, intraoperative, post-operative and post-discharge phases of the PSH patient management process flow into the data mart from the electronic medical record. The information in the data mart is used to track patient progress through their clinical course, and to produce monthly reports for team leaders, and quarterly summaries for hospital executives. Analysis of the data is used to generate process improvement changes and monitor the impact of the changes.